This article is a short summary of Super Mario Maker for Nintendo 3DS. Super Mario Maker for Nintendo 3DS is a handheld port of the Wii U title Super Mario Maker, released in December 2016 for Nintendo 3DS. Rather than focus on online play, Super Mario Maker for Nintendo 3DS instead focuses on sharing courses with other player locally. Earn in-game medals in 100 built-in courses and access recommended courses from the Super Mario Maker™ game on the Wii U™ console. Plus, design courses and share them with other players via the StreetPass™ feature and local wireless**! Play recommended courses from the Super Mario Maker™ game on the Wii U™ console and take on that game's 100 Mario Challenge. Share courses with other players via the StreetPass™ feature and local wireless. With exception to the Mystery Mushroom and Big Mushroom, all of the course creation tools, settings, and objects from the Wii U version are available in this game, as well as including an interactive tutorial featuring Mary O. and Yamamura titled "Yamamura's Lessons". Players can also go online to play courses created by other players in the Wii U version, either by looking using the Recommended Courses feature or through 100 Mario Challenge; it is not possible to search for courses by code in this version of the game. In addition to this, players can also play the Super Mario Challenge, consisting of 100 pre-made courses from Nintendo, which also include medal challenges that require a certain objective to be completed in the course. Rather than posting courses online, players can instead share courses with each other using local wireless or through StreetPass. Players can also send incomplete courses to other players in order to collaborate. 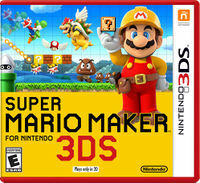 Notably, Super Mario Maker for Nintendo 3DS does not support the stereoscopic 3D feature of the Nintendo 3DS family of systems in any fashion, regardless of the model of system being played on. 1.02 December 1, 2016 Allows the game to access Recommended Courses and 100 Mario Challenge, fixes various issues. 1.03 April 27, 2017 Issue fixes. 1.47 November 7, 2017 Issue fixes. ↑ Super Mario Maker for Nintendo 3DS on the official Nintendo website. Retrieved September 1, 2016. ↑ Super Mario Maker for Nintendo 3DS on the European Nintendo website. Retrieved September 1, 2016. ↑ "Grab your hard hats! #SuperMarioMaker for Nintendo #3DS arrives on 03/12 in AU/NZ! #NintendoDirect" Nintendo AU NZ on Twitter (September 1, 2016). Retrieved September 1, 2016. ↑ Super Mario Maker for Nintendo 3DS on Nintendo of Korea's website. Retrieved July 11, 2017.